Well, duh! Sondheim saw her in “Sweeney Todd” and (privately) proclaimed her the best Mrs. Lovett ever. He urged her to essay Mama Rose. She took his advice, and is now the toast of theatregoing Britain. 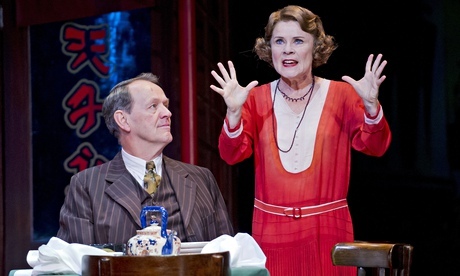 Today’s reviews for Staunton and the “Gypsy” production at the Chichester festival are five-star. (See one here.) And guess what? Those of you watching the current “Inspector Lewis” season Sunday nights on PBS will notice from the photo that Rose’s Herbie is none other than Lewis himself — Kevin Whately. Will Broadway ever see this production? It’s not impossible, but a London transfer would be first. “Gypsy” was revived less than a decade ago in New York, but if they can keep bringing back “On the Town” why not Gypsy? And if you’re thinking: Imelda is following in Patti LuPone‘s footsteps (“Sweeney” then “Gypsy”), La Patti was once knocked for following Merman’s path. All these ladies are terrific, so who cares about critics? Will LuPone’s “Gypsy” Do Broadway?